I installed a 14 tooth front in place of the 15 and still have a lot of adjustment left on the stock chain. The pulls nicely up hills but will still cruise all day at 70 with quite a bit of speed left in reserve. Wombat I have a 1550 pelican box on mine. They come in smaller sizes are pretty reasonably priced. They're also almost indestructible. I just drilled 4 holes in the bottom and bolted it to my rear rack using SS hardware and large SS fender washers top & bottom. You have to use a pad lock but for the money and beating they take it's a good option. You can kind of see what it looks like in the picture on page 3 of this post. I added 4 bungie buddies so I can strap stuff to the top. As far as handgaurds I'm running the EMGO pro version. Just one more reason to make ADVRIDER my first stop each day!!! I've been riding dual sports since 1972, most of them have been Yamaha two strokes. 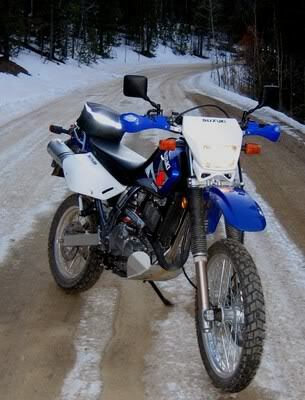 Sold my DT250 on Friday and I'm picking up my new 2006 DR650 (blue) this morning - I am excited. I was considering a KLR for a long time, but I started doing a lot of reading and research which pretty much convinced me to go with the DR. Then I did a group dual sport ride in March and saw in person that the DRs did better than the KLRs in the dirt, talked with the DR owners and they were a happy bunch. I'll post a pic after I bring her home. Anyone got an online link to an 06 DR650SE manual ? fatchance posted a link to the manual on page 5 of this post. Hey davorallyfan are those the yukon bags from Moto-sport on your DR? If so how do you like them and how long have you been running them? If they're not what are they? 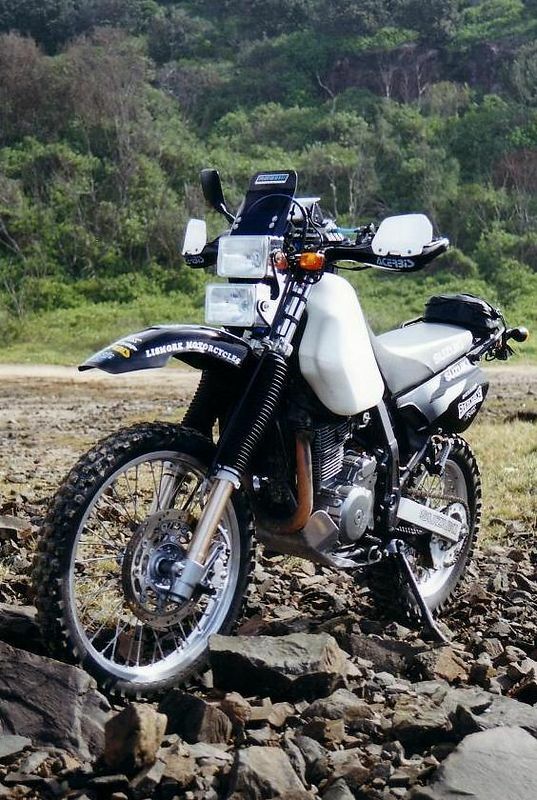 Here is a picture of our DR650s. 11motos, FrontRanger and rathawk like this. My abortion of a DR. I just took delivery of her today, with 1 mile on the clock. Had a nice ride home, she is very torquey and fun to ride - I believe I am going to enjoy this one a lot. Nice bike soboy. You know the white ones are faster! Motosport YukonII's and rack imported from the US. Been running them for 30,000km They bolt up neat and tidy, fit like a bum in a bucket, dont flap, hold a lot, offer crash protection (tested) are relatively narrow etc. A good compromise between soft and hard luggage. Only problem is they do leak a bit under very wet conditions and like most soft bags arent really lockable. FrontRanger, Dirty450 and rathawk like this. Had my 2003 DR for 6 happy months now. Tried the XT600E, The KLR650 and the WeeStrom, but this bike seems to fit me like a glove and will be my dirty love-slave. Had to do the new base gasket at 3000 miles, but it is now leak-free. Have Progressive upgrade springs, grip heater kit, and the Jesse idle screw to add to it - but that's happening before Buena Vista. So- recently I put on some new MT21's and took it into some loose stuff. 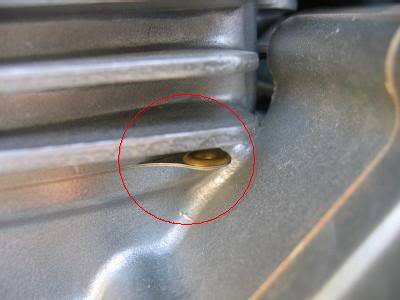 I've noticed that I need to gear down (like everybody has said) in order to climb without lugging the motor too much. If I change to the 14-tooth primary sproket, can I just reset the chain tension adjuster, or do I need to pull a link from the drive chain? Anyone? This thread is great, by the way...big ups to everyone for keeping it going! Well thought I'd add a pic off my toy. I got it approx a month ago & have had lowered heaps & have just got the bashplate on & the bars & a few other things changed. Loving it, all I need to do now is to test the ground clearance off road. Thanks for the advice all on the mods. I picked up the Acerbis Rally Pro at my local shop and was wondering, first if it would even fit the levers (anyone have these), but also, will I lose my anti-vib stock ends? I assume that's what those black weights are. I replaced my broken clutch lever and it's pretty loose in the slot. And I have a black washer left, so I'm wondering if there is a washer is in contact with the clutch lever in it's slot to add to a tighter fit, or is this extra, just from the last bolt to the stock guard. So, in conclusion, i currently have, bolt start from top, though clutch lever and housing, to the .375" spacer tube, matching black washer, locking nut, then it would go through stock handguard bottom. Or is my replacemet lever, just a slight bit thinner? I have this too and I just got a 2006. I need to learn more of the gasket issue. I've been doing a bit of thinking lately and have come up with the following conclusion. A well set up DR would have to be the ideal Distance Dirt Tourer. This is probably not news to anyone on this thread but having owned and ridden quite a few different approaches to the adventure philosophy I keep coming back the the humble DR. 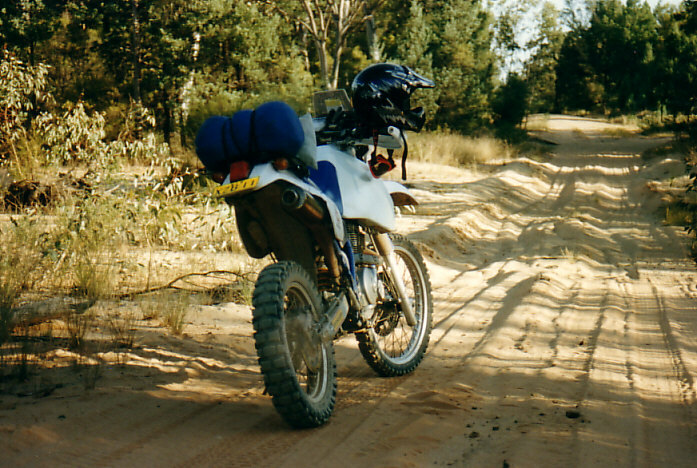 I ride a DRZ at present and this is not likely to change anytime soon because it is so good at what I use it for (middle distance adventure work), but if I was going to set out on a really big trip, the DR would get the nod. Which has got me thinking about a DR/Z duo in the shed. I keep thinking it seems like duplication but if both bikes were set up with an intended purpose it begins to make sense. Why? Well for a start I am not a big fan of road riding. I get bored, booked and to be honest bounding kangaroo's scare me more than they used to. My current riding mainly consists of day trips and 2-3 day tours of discovery but I am hoping to do some longer trips as things settle at work. A lot of people would see this as the ideal reason to buy a DL/GS/950 but I figure that I only want to sit on 110-120km/hr in the open and a DR will do it all day long. Why spend the extra money on something that is more complex and less manageable in the dirt? Being an analytical thinker (an occupational hazard), I have looked at most attributes in detail and the DR still makes the most sense for long distance dirt work. there is a certain peace of mind that comes with riding a solid bike. Performance and technology are great things but in the wrong environment they can be a disadvantage. In the case of something going wrong, fixing the DR in the outback is not as daunting as stripping the tank/s off a fuel injected twin. That simplicity has a flow on effect when it comes to price and availability. The DR has been around basically unchanged for 10 years now which means they are cheap and parts are plentiful (at least in Australia where they seem to be selling better than ever). For the average rider this allows for a few modifications and the freedom to take the bike in the dirt without fear of financial ramifications. 2) Comfort. The DR is no lounge chair (although I have never ridden one with an aftermarket seat so maybe they can be) but big days are limited only by the rider. Having done over 100,000km's on three DR's I can say with all confidence that the bike is certainly capable of covering ground with surprising ease. It has taken me a while to realise this but for some strange reason, 750km days on a V-Strom are just as fatiguing as on a DR? The only reason I can attribute to this phenomenum is the extra thought required to keep a V-Strom on the desired path in the dirt. Sure it will do it but it requires restraint and I suspect this may be mentally fatiguing? A few tricks can help out here too. I used a sheepskin on mine (a poor man's Corbin) and a small screen made a huge difference on the road. For those interested in making one here is a bit of a guide to making it yourself. The best place to start is with a cardboard template. In order to be effective, I generally try and make the screen throw the air at my neck so that the helmet is free from buffeting. This can take a bit of experimentation but it is well worth the effort because it takes a lot of the pressure off your chest and neck. Once a template is made, take it down to the local acrylic supplier (lexan is better if you can get it) and get them to cut it (3mm lexan is the best to work with in my experience). The next step involves heating the acrylic (I use a small camping stove) and bending it to suit the shape of the headlight surround. The shape of the DR/DRZ headlight surrounds are suited to screens because it is fairly broad without any radical angles. Be careful when heating the acrylic that you don't heat it too fast because it will bubble, patience is the key here (remember to hold it with pot holders or something similar too because it will get very hot). Once hot (you will see it flex) I line the screen up on a flat surface and place another straight edge (like a chopping board) above it to get a straight bend. I generally put a bend on either side to make it fit nicely on the headlight surround. In order to mount it, I drill two holes in the headlight surround and then another two in the screen. Acrylic is a bit touchy to drill so it is important to take your time, if possible use a blunt drill bit and make sure that you have something solid behind it (like a piece of timber). Using a sharp drill may lead to the bit grabbing on the screen and cracking the acrylic (trust me on this one). Once the screen is mounted, check that it doesn't interfere with any of the cables (sometimes the brake hose can be a problem when the forks are compressed) and then take it for a ride. Unless you are really lucky, it will generally need some fine-tuning to get the airflow right, and this is when you can incorporate a flip at the top to fine adjust the airflow. I generally take off the headlight surround (screen and all) and heat the top couple of inches of the screen. Using the straight edges, I then give it a small flip forward about an inch or two down from the top, depending on how much the airflow need to come up. To finish off the process, I bevel an edge around the screen with a file or a dremel and then tidy it up with 1200 wet and dry, just to give it that factory finish. 11motos, SlowerThanYou, FrontRanger and 1 other person like this. 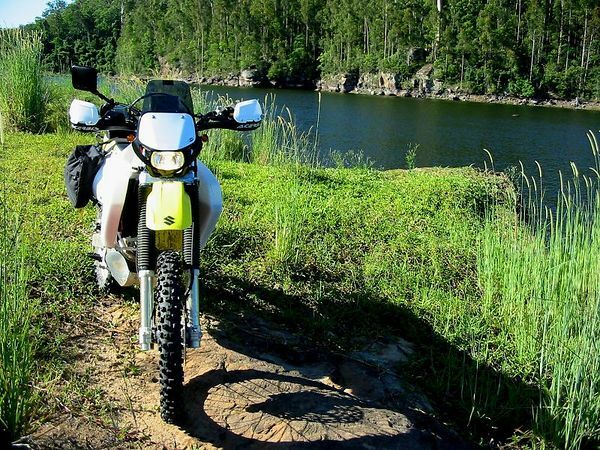 Dirt Ability: In my mind this is the big strength of the DR when compared to the multi-cylinder adventure tourers. There may not be a lot of difference on formed tracks but when things turn nasty and you have to drag it thru a boghole or muscle it across a creek the DR shines. A bit of work is required to access the DR's true ability in the bush but a set of springs (depending on weight), some cartridge emulators and a weight loss program can pay big dividends here. A lower seat height can be a plus too, especially for riders who aren't yet capable of the effortless, feet up feats of balance displayed by Rally riders. Even loaded with two weeks worth of camping gear the DR is still manageable, the same can't always be said for 250kg twins. Creature Comforts: Electrical supply is better than most dirt bikes (180W from memory) which is plenty to power a set of heated grips and some aftermarket lights (the standard one is actually pretty good though). Luggage carrying capacity is pretty good too with options ranging from throwover bags to alloy panniers. The DR has a pretty good steel subframe which in my experience handles rough terrain without complaint. For off-road touring where security isn't as big an issue, a set of the new Ranger Dirt Bagz and a small rack will be more than enough to stow my camping kit. 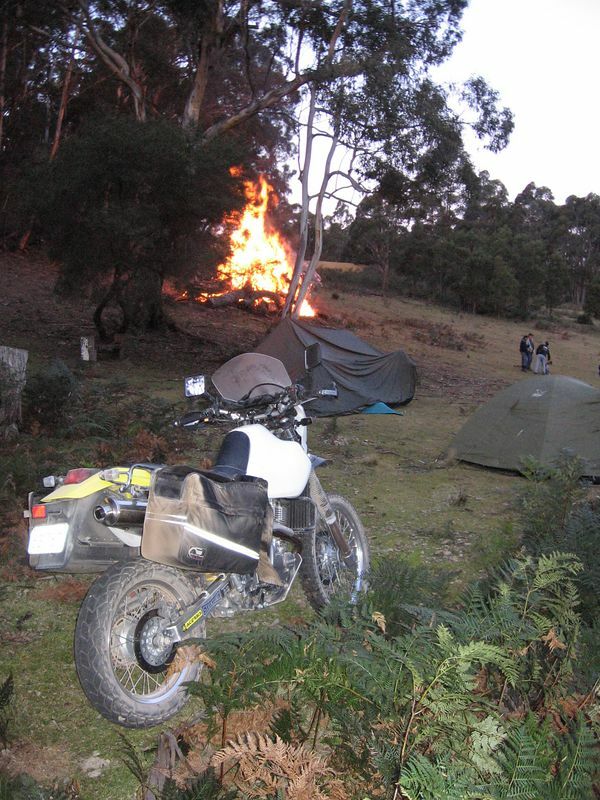 Fuel Range: With an Aqualine tank (32Ltrs) and an average fuel consumption of 17-18km/ltr the 650 has a range of 540 - 575km's which is enough for all bar the most isolated outback trip. Even with the IMS tank (20Ltrs) in place the range is plenty for most trips. FrontRanger and Dirty450 like this. Photo82 We're BIG pants people! For noobs who haven't read much on the base gasket thingy, searches here will give you many accounts of fibre gaskets that are still holding strong. Other searches here http://banditmotorcycles.com/ipw-web/bulletin/bb/index.php should provide you with quite a bit of info on the issue. I'm not sure on which model year the fibre gasket issue surfaced, but midway through the '03 production, Suzuki upgraded to the better gasket - without acknowledging the problem, of course. My replacement cost $240 out-the-door. Since I'd bought my bike barely used at a deep discount, I'd already factored in the new gasket cost. I'd chalk this up as one of the few production problems inherent in this bike. Every dual sport I've owned has had some sort of Achille's heel that can be completely fixed. My KLR650 had its "doohicky" and butter-metal fasteners...my Yamaha XT600E had a brittle wiring harness around the steering head...The positives of the DR650SE FAR outweigh the negatives, IMO . 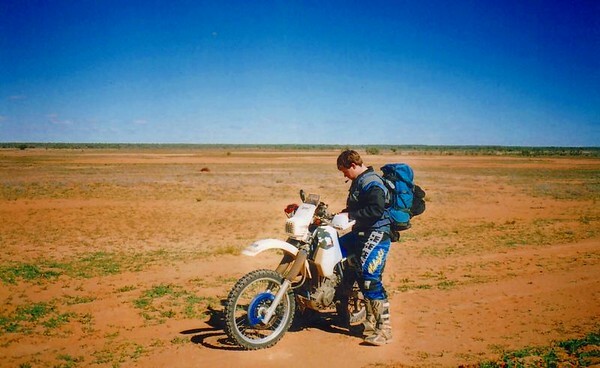 Great posts Danny, I agree the DR is the best bike out there for 50/50 riding. With the corbin seat and my light weight, the DR is the most comfy bike i have ever ridden. They are suprisingly capable in the dirt, ground clearance, suspension and weight are the limiting factors. I been thinking of trying a corbin for the DRZ, but have my doubts if it will provide the same comfort level as the 650s.